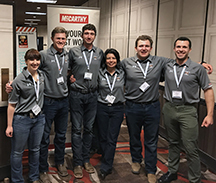 Four Montana Tech Association of General Contractors (AGC) Club teams competed in the Region 6 & 7 Associated Schools of Construction Student Bid Competition in Sparks, NV February 6–9, 2019. AGC Club competed in the Region 6 (Intermountain West schools) for Design-Build and Heavy Civil, and in the Open category (all schools nationwide) for Pre-Construction and Concrete Solutions. Teams are coached by Sonya Rosenthal, industry coach; Bill Ryan, Construction Technology Instructor II; Matt Egloff, Civil Engineering Instructor III; and Kishor Shrestha, Civil Engineering Assistant Professor. The Heavy Civil team took 3rd place for the second year in a row in Region 6 behind Colorado State (1st) and Northern Arizona University (2nd) with 15 school competing in the category. Their project was a complicated pipeline replacement in Washington state bordering Union Pacific railways and residential properties with over 400 utility crossings to take into account. Weather and water were major risks and the Heavy Civil team was one of the only teams to identify and price this risk. The Heavy Civil team consists of Andy Anderson, Harold Yocum, Jory Breen, Tucker Thatcher, Caileigh Norman, and John Vanek. 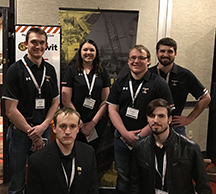 “The AGC Design-Build team won the hearts of industry sponsors and were the darlings of the post competition social,” noted Bill Ryan, faculty coach and AGC club advisor. The team did not place in the top three out of 12 teams in the category. Design-Build was tasked with creating a Performing Arts Center on a large high school campus in Sacramento, California. The team tackled this challenge by creating a design with a beautiful glass dome that would promote community-school interaction and a theater area that entranced its’ occupants. The students had only 13 hours to design, schedule, bid and show how they would promote quality and safety on this project. The team was informed by industry sponsors that the point difference between placing and not placing was very tight. The judges noted that they were proud of the team’s high score and recognition in such a competitive category. The design-build team included Cody Wiers, Sam Johnson, Jesse McLaury, Ethan Jones, Maria Ralph, and Davis Stahl. Montana Tech’s Pre–Construction Team had a very strong showing in both their presentation and Phase 1 and Phase 2 deliverables. Their project was a seismic retro fit of an existing parking garage in Los Angeles in an active shopping mall. The project included precise sequencing of work performed and work crews as not to disrupt consumer traffic and parking availability to the mall. The Pre-Construction Team placed in the middle of the pack out of 13 teams. The Pre-Construction team consisted of Katie Hampa, Henry Logo, Kade Woodhall, Austin Taylor, Tim Heick, Brett Hibbs, and Cameron West. 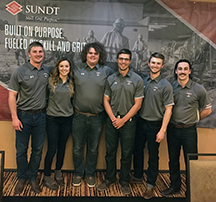 Concrete Solutions was a hit with the judges by starting their presentation with a pre-work stretching exercise similar to the program used by the Industry sponsor SUNDT Concrete. The team even invited the crowd to participate to get blood flowing. In the end, the Concrete Solutions team did not place but did have a strong proposal and resulted in a dinner invitation from Baker Concrete for faculty coaches and two team members to talk more about the teams and the university. Concrete Solutions includes Trevor Hopf, Max Hiller, Brock Polley, Connor Froc, Ralph Thrall and Kelly Harbach. "I'm extremely proud of all of the Montana Tech ASC teams,” noted Andy Anderson, Civil Engineering student and AGC Club President “Our teams have faced a huge amount of unforeseen adversity this year, but were still able to present a strong showing, and even bring back a third place trophy! Given our outstanding performance and the number of students who are still receiving job opportunities because of the ASC competition, I would consider Montana Tech's ASC teams to be the school's strongest asset, and we're looking forward to continuing Montana Tech's reputation at the ASC competition next year!" For more information or to join AGC club, please contact, Andrew Anderson at aanderson2@mtech.edu; or Bill Ryan at bryan@mtech.edu or 406-496-3700.